Do you still struggle with getting your kids to eat vegetables? I guess I'm one of the lucky ones because my kids like a wide assortment of vegetables. Of course there are some it's a real struggle to get them to eat...or even try. They are both strong-willed and independent (which is good and bad) so sometimes the battle is long. However this mom has found ways to outsmart them over the years. One of which is swapping out things I know they already like to eat like pasta and replacing it with what I call "mom's special pasta". First it was using things like spaghetti squash and zucchini for noodles, and now it's using Veggie Made Pasta from Birds Eye. Veggie Made Pasta looks, tastes, and feels like traditional pasta, all while offering up a full serving of vegetables. And if you don't tell them (or let them see the bag) they honestly have no idea it's not traditional pasta! Plus with the easy microwave prep instructions it's ready in a matter of minutes. Score one for team mom! 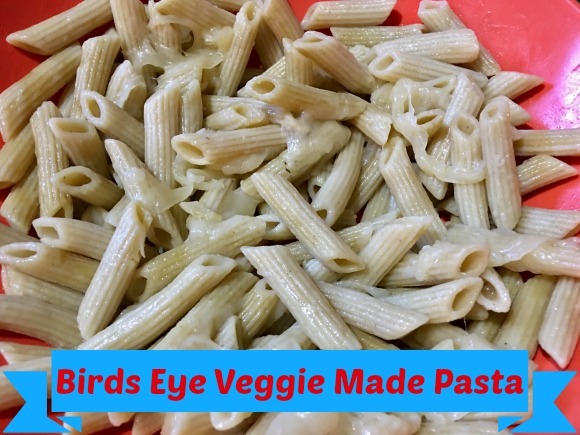 Birds Eye’s Veggie Made Pasta comes in spinach lentil with Alfredo sauce, zucchini lentil with cheddar sauce, zucchini lentil with Alfredo sauce, or original zucchini lentil. So far we have only tried the ones with sauce already on them as I haven't caught the original in stock either time I went to the grocery store looking for them. I guess they area super popular since you can add whatever sauce or toppings to it you like. Out of the ones we have tried I think the zucchini lentil with cheddar sauce is our top pick. I like to add some grilled chicken strips to ours to round it out for a complete meal when I'm not using it as a side dish.